A past land use can produce effects that last for decades. Up until the middle 1960’s a chicken house was maintained in the middle of this field. Here is an old foundation stone that supported one corner of the structure. Despite the fact that the house and chickens have been gone for over 40 years, you can still see the area once enclosed by the chicken yard fence. Outside the former yard the Indian Grass abounds. Inside, a slow transition to native grassland is underway. During the years of occupation by chickens, the soil was cleaned of vegetation and subjected to erosion and compaction. Compacted soil results in the complete breakdown of the soil ecosystem. When the chickens were removed, the soil was not conducive to growing plants and typical farmland annual weeds began to colonize the area. 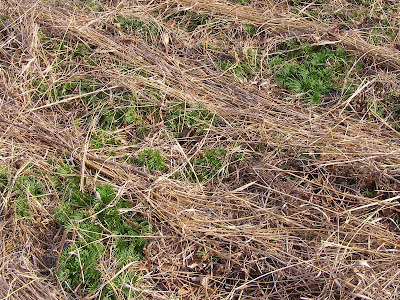 Tall Fescue is now the most common grass here, but even that hearty grass doesn’t thrive here. 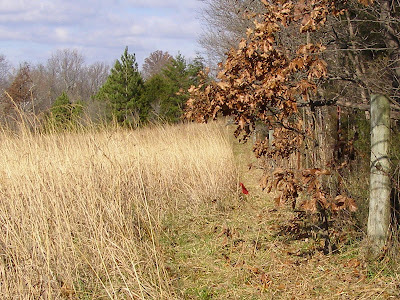 There are a few stalks of Little Bluestem scattered around, gradually working a transition from exotic plants to natives. The change still has many years to go. Battling invasive plants, such as this Teasel, will be the major management activity here. The native plants will eventually claim this area if the non-natives are kept out of the way. This particular area will probably be out of sync with the rest of the field, but given another 50 years, you probably won’t even suspect there had been any damage here. This shot reminds me of flying above a stand of pines. Actually, we’re flying at an altitude of about six inches. This stand of pines is really a clump of moss. 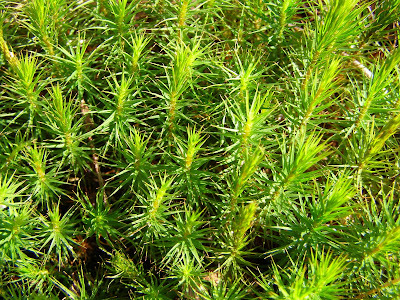 From this angle it looks more like a collection of pine seedlings. 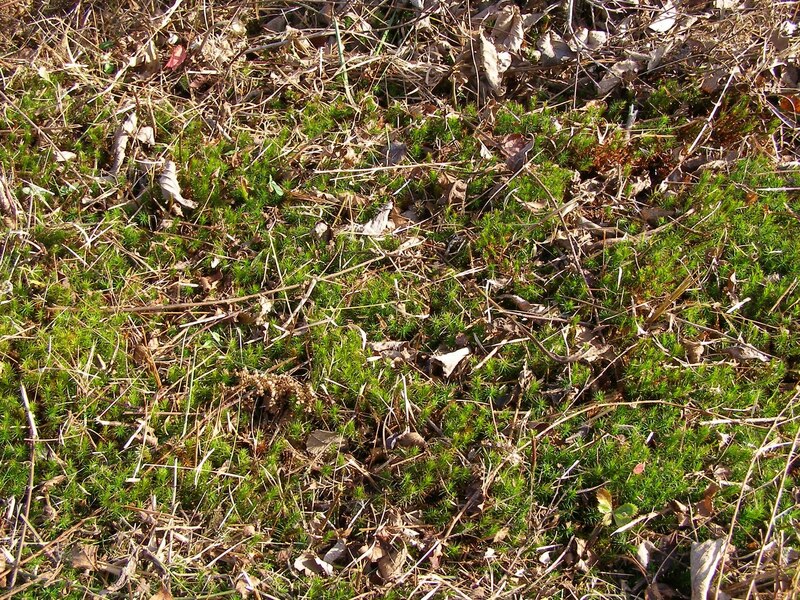 I found a lot of this moss in the low areas of the field I mowed. 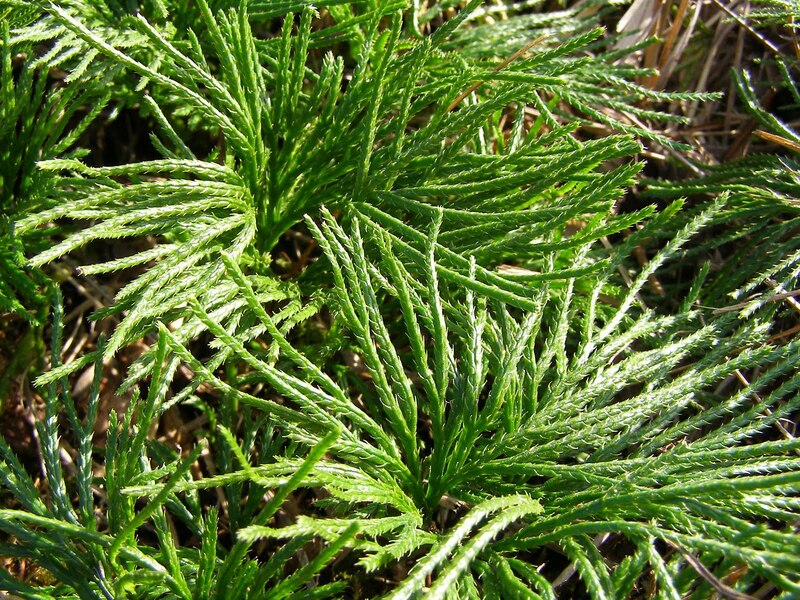 It appears to be of the genus Polytrichum, most likely species commune. The total height is about three inches and the color is a more vibrant green than indicated by the photos. It’s really thick in some places and displays a sparkly shine when reflecting the sunlight. You can find it tucked down among the tall grass stems about any time of year, but it’s not until you mow that you can see how really wide spread it is. Its height puts it just below the cutting blade, so the mower effectively cleans everything off for an unobstructed view of the moss. 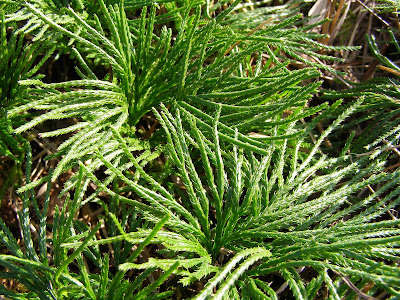 I usually think of mosses as quite tiny plants and it’s really neat to find one this large. The dark green moss is impossible to miss here. 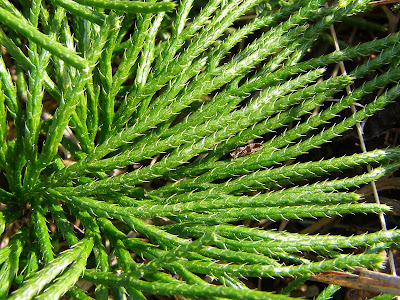 I really enjoy seeing groups of plants like this that I know little about. It means that I’m not likely to run out of things to study at Blue Jay Barrens. 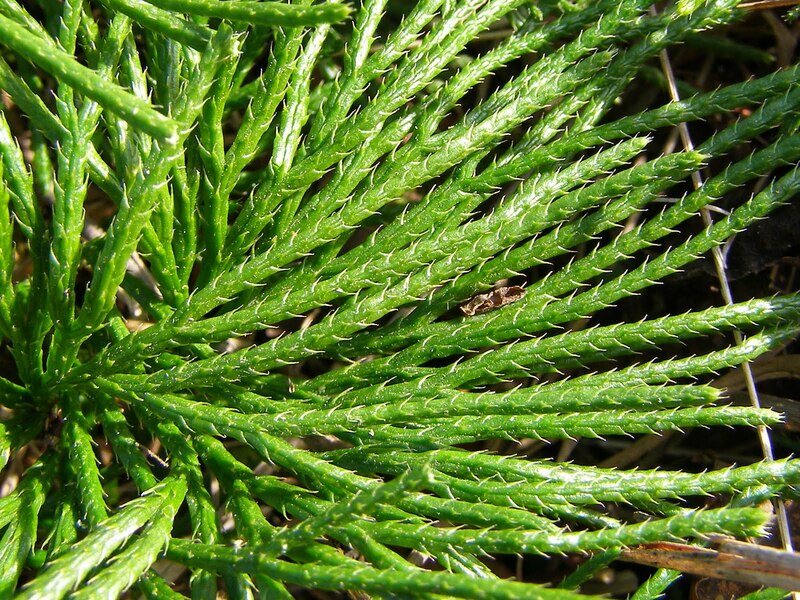 This is a plant that’s most commonly found in the shaded woods. I guess the tall prairie grasses provide the necessary shady environment to allow these Ground Cedars, Lycopodium digitatum, to prosper. The leaves have a waxy shine that makes them sparkle in the sunlight. The cedar name comes partly from the similarity of the spiky points on the branches to cedar needles. The branches remind me of centipedes. A look at the underside of the branches is necessary for proper identification to species. The important feature is that little point down the center of the branch. Things are much less dense when you look beneath the canopy. 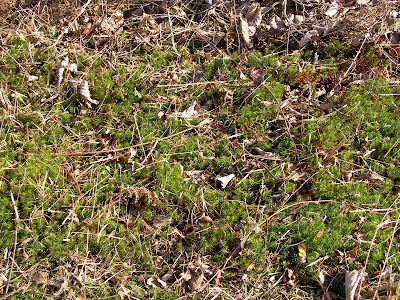 Ground Cedar spreads by way of runners. As the runner extends, shoots emerge to form new plants. It doesn’t take long for these plants to fill in an area. The plants will do fine in this moist area over the winter. The habit of growing in the shade seems to be more a necessity of staying hydrated instead of intolerance to sunlight. By the time it gets hot and dry next summer, these plants will be well protected by the shade of the tall grasses. The Sycamores, Platanus occidentalis, did extremely well this year. A disease went through this area about 15 years ago that took out a lot of big Sycamores and made me wonder if any were going to be spared. Most that survived came back as stump sprouts like this tree above. Fortunately, trees will make tremendous growth if they are sprouting from an established healthy root system. I hope that sinuous base isn’t going to be trouble later on. Fruits were abundant on all of the trees. It’s been a long time since I’ve seen the Sycamores here put on fruit like this. Those fruits will hang tight through the winter and then break up in the spring to allow the seeds to disperse. The lower bark is taking on a nice flaky appearance. Any time I see flaky bark, I think of homes for bats and insects. 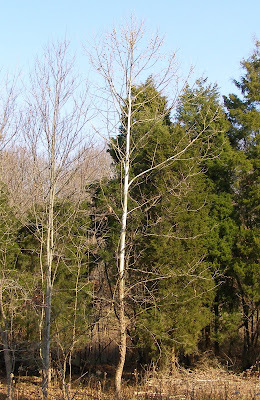 The younger trees tend to show more of the clean white trunks. As they mature, odd bits of bark that don’t properly exfoliate give the trunk a more mottled appearance. 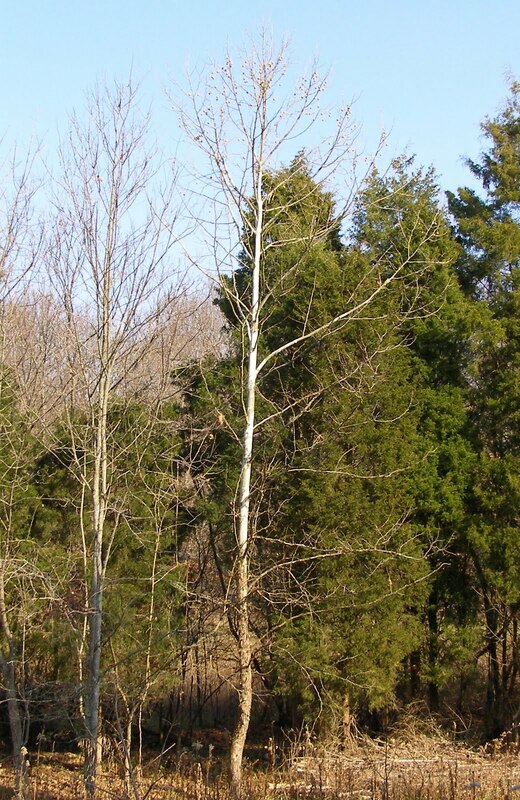 Sycamores can grow to enormous size. I hope these have a chance to do just that. Mowing is always slower going around the outside of the field. There are tree branches in the way, old dead furrows left from the days of plowing, odd little corners, and a greater abundance of trees and shrubs needing to be marked. My first task is to cut the irregularly shaped areas around the edges so my cutting path is all straight runs or gentle curves. Here I’ve finished the bottle neck at the north end of the field. The point at the south end has also been cut. Now I’m left with no sharp turns to negotiate. My path is like a race track as I gradually close in on the center of the field. According to the manual, JR’s top speed is 4.4 mph. 4.4 mph is an easy walk if you’re going down a country lane. It’s a little bit different when it’s a forced march over uneven ground while trying to guide the mower and watch for obstacles. This is where I want to end up, the middle of the field. In some really rough places I had to slow to a lower speed in order to keep my arms from being ripped off at the shoulder. Doesn’t look too rough from this angle, but the dark strip going across just in front of the lighter colored Indian Grass is a wet swale that still bears the ruts from an earlier owner’s inappropriate tractor travel during a wet time of year. I’m still learning what JR’s capabilities are. The incidence of Autumn Olive is increasing at a discouraging rate. 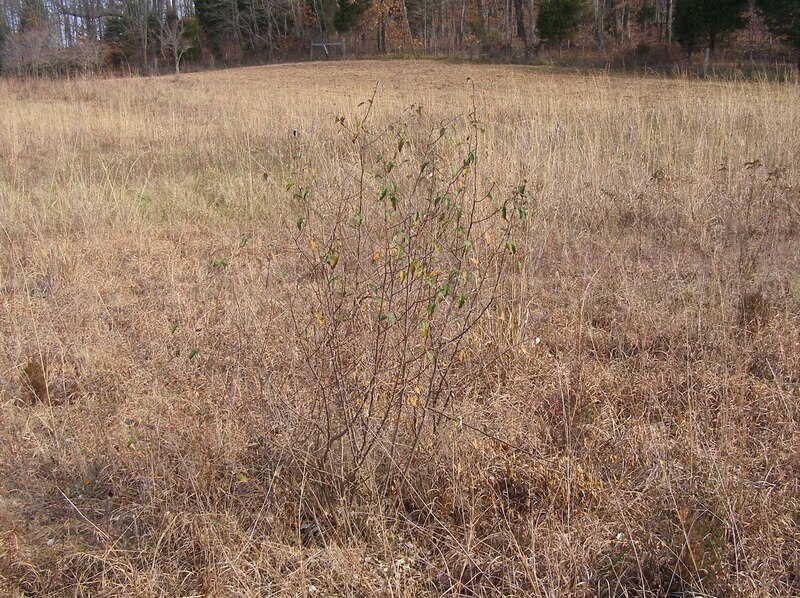 It’s going to be impossible to eliminate this shrub when only a tiny percentage of property owners are willing to control it. This particular Autumn Olive did perform a valuable service this year. I found a nest tucked down in the branches. The ant hills really stand out after a mowing. The oak trees behind have grown considerably since the last mowing. DR had no trouble weaving around these trees. JR isn’t nearly as responsive to subtle commands. I keep a little bit more room between the tree and the cutting blade, so JR doesn’t get into trouble. Most of the trees being saved here are Flowering Dogwoods. The dogwoods are also popular locations for nest building. I usually remove old nests, just in case old nests inhibit new nest construction. The brown area in the foreground was and will again be a thicket of Winged Sumac. They’ll now have to compete with the oak growing in the middle of the bunch. 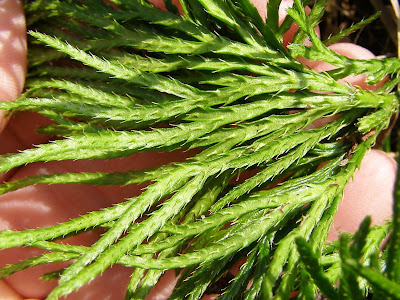 The Virginia Pine is being maintained as a single tree. 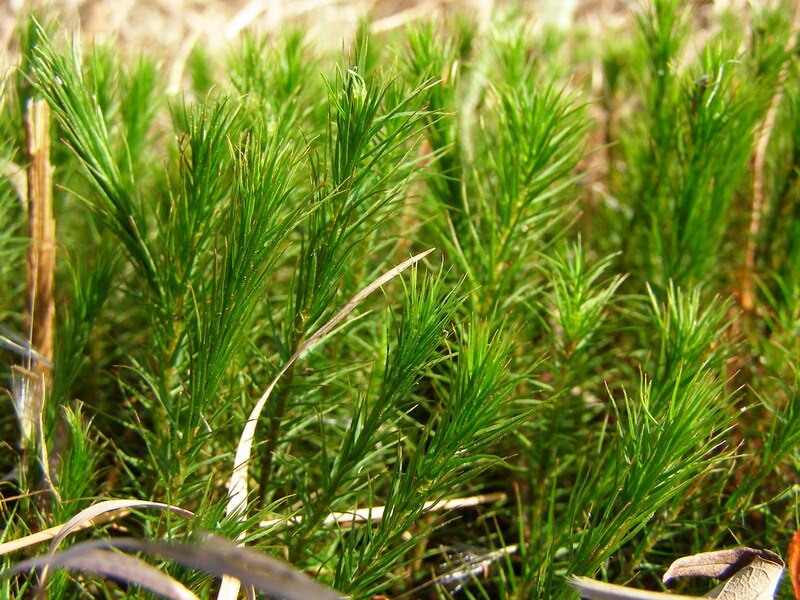 I mowed dozens of pine seedlings from around the mature tree. 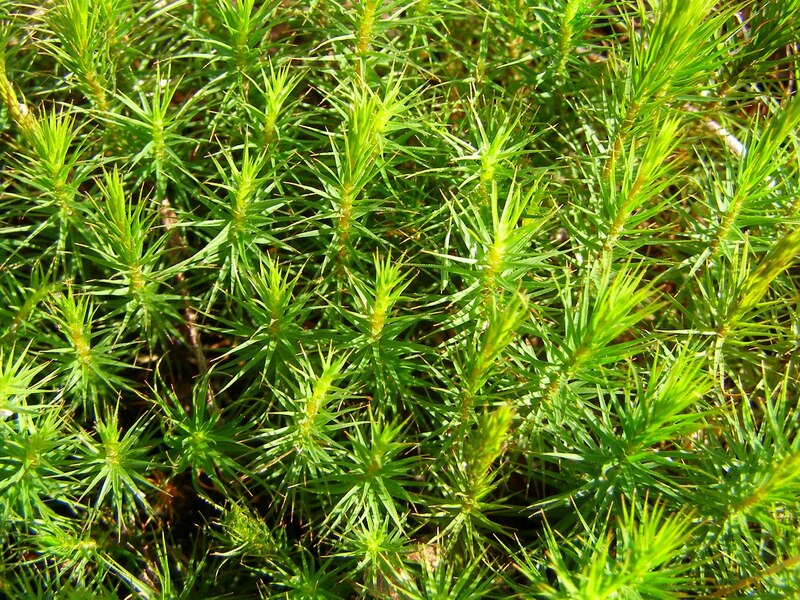 If I let it, Virginia Pine would probably cover the whole field. The completed field. It took me 10 hours, including travel time to and from the barn, to mow this 4.1 acre field. 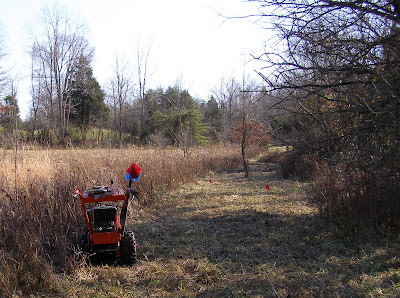 I marked 185 trees and shrubs with red flags. My plan is to mow about 11 acres more before the end of December. Once the temperatures drop, I have to stop mowing because I can’t stick the flag stems into the frozen soil. All I’ll need is about 30 free hours when the weather is right and the grass is dry and I’m not at work or doing family activities. 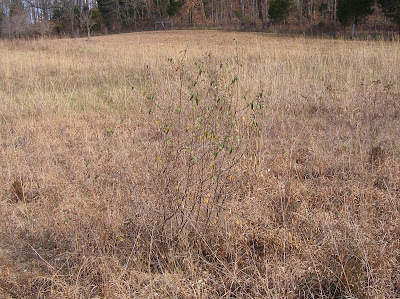 This is a shot of the same area when I finished mowing in December of 2006. With the slower DR, it took me 16 hours to mow the 4.1 acres. I marked 960 trees and shrubs for elimination. It’s encouraging to see that I’m dealing with less than 20% of the number of invasives I had three years ago. I think everyone who lived within 5 miles of me came to see what the deal was with those red flags. It would have been easier for me if I had just posted a billboard explaining what was going on. Just about everyone got the same half puzzled, half fearful expression when I started explaining native ecosystems and invasive plants and the need to eliminate one without harming the other. I’ve mentioned earlier that I plan to mow several of the fields this winter. I’m beginning in this field of mixed grasses and forbs supported by a low pH, shale based soil. The purpose of mowing is to eliminate trees and shrubs detrimental to the continuation of healthy grassland. I’m criticized by some because I’m destroying valuable wildlife cover. Of course, I’m also criticized by others for purposely killing plants and still others for letting the field grow up into a mess of weeds. There are neighboring fields that will maintain similar cover all winter. I think the voles probably suffer most when I mow a field. This field became a hawk magnet the last time it was mowed. I’ve had people offer to bring their bush hog in to mow my field for me. They’re puzzled when I explain that I don’t mow in order to cut the grass. I mow because it’s the most efficient way to search every square foot of the field and find those plants that have to be removed. I can’t achieve the same results from the seat of a tractor. For me, the cut grass is only an indicator that I’ve already searched that part of the field. As I mow, I watch for those plants that I want to eliminate from the field. As I cut them down, I mark them with the red flag of death. Growing conditions vary considerably across this field. The low areas support a tall, lush growth. These wetter areas support a lot of invading Tuliptrees. 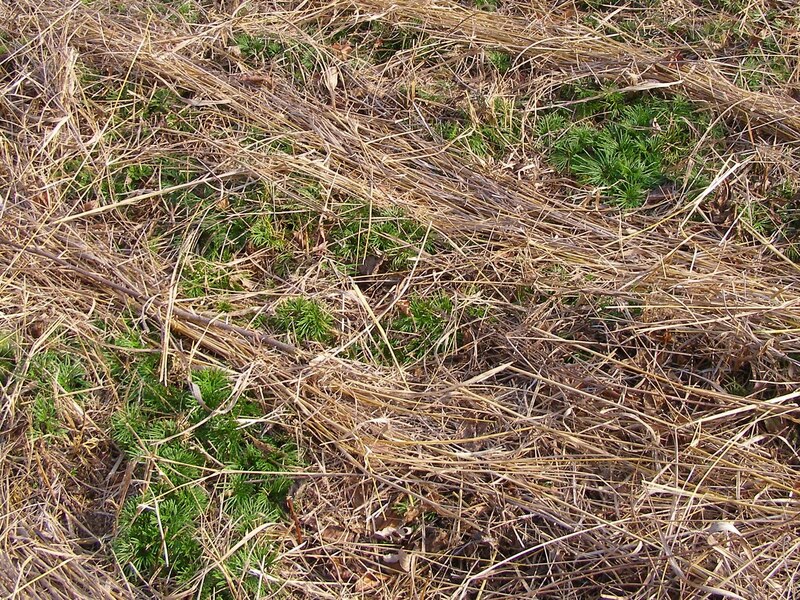 Dry portions of the field display a sparse vegetative mix of short grasses and low growing forbs. The most likely invasive here is Multiflora Rose. I leave several oaks growing in the field. I try to space them far enough apart that enough sunlight would make it through the mature trees to maintain the existing prairie grasses. I hope that the results will one day resemble an oak savannah. There are many special relationships between the oaks and the prairie inhabitants that I would like to see continue. Blue flags are used to mark those features that should be spared from the mower. As I pass by, I’ll mark things like oaks, ant hills, holes or big rocks that I don’t want to hit with the mower. You may have noticed that this is not DR Brush. DR is getting old and no longer has the speed or stamina to cover whole fields. This is Doc Junior, just call him JR. JR has more muscle and more speed that DR. Too bad the operator can’t be similarly revitalized. I’ll give you a run down on JR’s performance after we’ve had more time to work together. You can see how hard it is to see a little tree hidden in the grass. Without the blue flag it’s unlikely that I would have avoided cutting this little oak. Not all of the oaks are worth saving. This was a nice tree until a buck deer decided to spar with it. Deer have a way of rubbing just the trees you would like to save. Even if this tree survives, it’s doubtful that it will make it to a healthy maturity. The best option is to cut it and encourage it to produce a new sprout. This tree has a healthy root system and the energy stored there would be better spent producing new growth rather than repairing damage to the old growth. Mid November is the start of the hands-on management season at Blue Jay Barrens. Weather permitting, from now until the end of February is the time that the majority of the mowing and cutting will occur. The traditional opening day ceremony is the mowing of the fence line. It’s worth a little bit of effort each year to keep the fence from being overgrown. That strip of gravel on the right side of the picture is the township road. The old fence was built almost at the edge of the road, but I chose to put the new fence at the edge of the field. I must have been a terrible fence builder because everyone who went down the road stopped and asked “Are you building a fence?” Everyone within 5 miles of me must have come by and asked that question. I thought the fact that I had fence posts in the ground and was attaching woven wire fence to the posts, made it obvious that I was putting up a fence. There were several deer beds in the grass along the fence. We don’t get a lot of traffic down our road, but it’s odd the deer would sleep 15 feet away from passing cars. DR Brush does a fine job mowing along the fence. I had to replace DR’s mower deck a couple of years ago and the new design has rounded corners on the front that don’t catch on the fence wire. Two passes of the mower leave a clear zone almost four feet wide. Here’s the first red flag of the season indicating an Autumn Olive that will need to be sprayed in the spring. To be marked by red at Blue Jay Barrens is equivalent to being handed a death sentence. I have enough mysteries needing solved at Blue Jay Barrens to keep me busy for a lifetime. This is a puzzling little patch of ground. For some reason, nothing will grow here. This 10 foot by 20 foot area has looked like this since I moved here. There is some erosion occurring here, but nothing severe. The site hasn’t changed significantly during the past 25 years, so it’s not accelerated erosion that keeps plants from growing. Roots grow across the area. These roots are from a nearby cedar. The roots come out of the surrounding soil at the level of this red colored soil layer. Maybe plant roots don’t penetrate this layer and are restricted to the topsoil layer in the adjacent areas. That may explain why the short prairie grasses dominate here. A lot of rocks here. I’ve found pieces of limestone, sandstone, quartz and oddities that must have been seriously altered by the meteor strike. Moving water does change the surface pattern occasionally. When saturated, the surface can be quite soft and when dry, quite hard. This site is near the area of one of the large family dump sites, but I don’t think the lack of plant life is a result of foreign chemicals contaminating the soil. A close up view of the soils reveals something quite interesting. Sand. Could this be decomposed sandstone brought near the surface as the shattered rock layers rebounded from the meteor strike? Sand is certainly less prone to erosion than smaller soil particles and it can be quite inhospitable to seeds trying to germinate. The sand particles seem to be from quite varied origins. This site certainly warrants more detailed investigation. I’ll have to put it on my ever growing list of things to study.